Would your group like to adopt a FOSH volunteer event? On the evening of Jan. 17, about a dozen Washington-area alumni from Florida International University took over the monthly bowling night we staff — and did they ever have fun! The group helped Armed Forces Retirement Home-DC residents who use wheelchairs get to the bowling lanes on campus. Then they assisted residents in getting into the lane and lining up a ramp in front of them. One push later — strike! (Or at least some of the time). Bowling happens the second Tuesday evening of each month. For details, write FOSH Volunteer Coordinator Lori Lincoln at volunteerfriendsofsoldiers(at)gmail(dot)com. Friends of the Soldiers Home wants to extend sincere thanks to these great FIU alumni for helping out on bowling night. You all are the best! Photo courtesy of FIU alumni. At Bowling Night With Friends on Aug. 16 we suffered a few technical difficulties, including broken lanes and frozen monitors. But we kept rolling right along! Lucky for us, Armed Forces Retirement Home staffer Carol Mitchell is a technical genius, and we know how to score the game by hand. 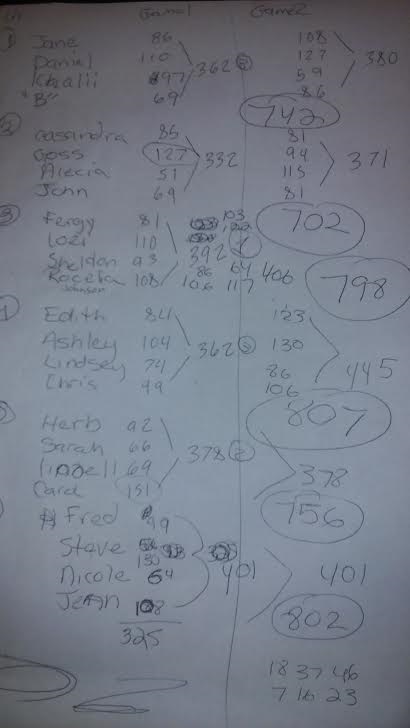 Residents continued to wallop volunteers, easily scoring in the 100s. It’s a good thing residents and volunteers were on the same team! As always, the joy was in helping others (and in figuring out how to adjust that ramp just right to get a strike or spare)! Thank you to our volunteers — Rocelia, Lonell, Lindsey, John, Vivienne and Paul. 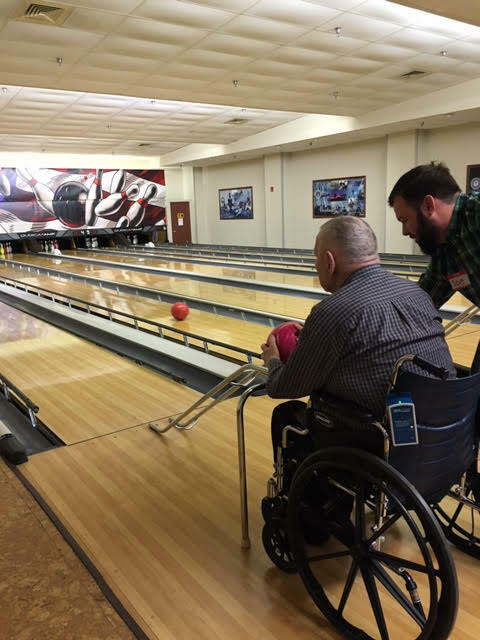 Bowling is really turning out to be a special program for Friends of the Soldiers Home, and our most recent game was no exception. Not only do the Friends and Residents have fun together, but the care and concern that they exhibit while making sure the less physically-able residents have fun, too, is tremendous! They practically look like engineers as they set up each roll. And nothing is better than everybody rooting for one another. At Friends of the Soldiers Home, our March Madness consisted of great fun bowling and Jingo playing! On bowling night, only volunteer Lou and Armed Forces Retirement Home-DC resident Mr. Ferguson managed to score over 100 points. But while high scores aren’t automatic, the fun and companionship at this monthly event always tops the charts! At Jingo, the March theme was religion, and never before have the volunteers and residents seemed more hesitant to call out the wrong trivia answers! We might have lost the fun if it weren’t for new volunteer Kim. She chimed in, right or wrong, reminding us all that despite the serious theme, Jingo is just still our favorite game. Photos and story courtesy of Lori Lincoln. March Madness fun with bowling (above) and Jingo (below). We weren’t planning to add bowling as a fourth regular monthly volunteer event for Friends of the Soldiers Home. But after a trial late last year, we found volunteers loved bowling as another way to connect with the men and women who served our country. So off we go! On the third Tuesday evening of each month, we assist veterans who need help getting to the lanes on campus, and we aid those who need assistance in playing the games. As pictures from last month show, everyone has a great time! Bowling now joins Jingo, Happy Hour and Saloon Night on the Friends’ monthly roster of activities. Special thanks go to FOSH’s Volunteer Coordinator, Lori Lincoln, and Carol Mitchell at the Armed Forces Retirement Home for making this bowling event happen. If you want to participate this coming Tuesday, Feb. 16, write Lori at volunteerfriendsofsoldiers (at) @gmail (dot) com. Story by John Hughes, photos by Melissa Sullivan.